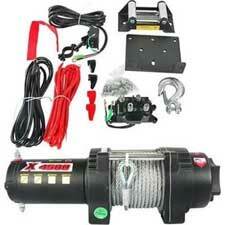 A winch is used to adjust tension of an attached wire or cable and is often used for towing and pulling. Winches are popular accessories for Jeeps, 4X4 trucks, and ATVs and for those in the snow removal service, winches are especially important. Winch motors often raise and lower the front snowplow blade and are also used in salt spreaders at the back of the vehicle. Winch motors are available as electric or as hydraulic or pneumatic pumps. We at Discount Starter & Alternator sell replacement winch motors and pumps for Meyer, Blizzard, Boss, Cessna, and other fine manufacturers. Browse our wide selection and shop online with confidence at Discount Starter & Alternator.